Out of all the top fighters in mma, Gilbert “El Nino” Melendez is the top prospect not fighting for the top mma organization in the UFC. Melendez has been very loyal to the company that made him in Strikeforce, and is ranked the #3 overall lightweight by sherdog and ranked #2 via MMA-Freak. Melendez was expected to fight Pat Healy for the Strikeforce Lightweight Championship on September 29, 2012 in Sacramento, California. It was announced late on September 22, 2012 that Melendez suffered an injury and had to withdraw from the fight. Due to Melendez’ injury, Showtime opted not to air the card without the main event, thus causing Strikeforce to cancel the card becoming the second MMA card cancelled within a month under the Zuffa organization. Melendez looks like he will not fight again until he is absorbed into the UFC. 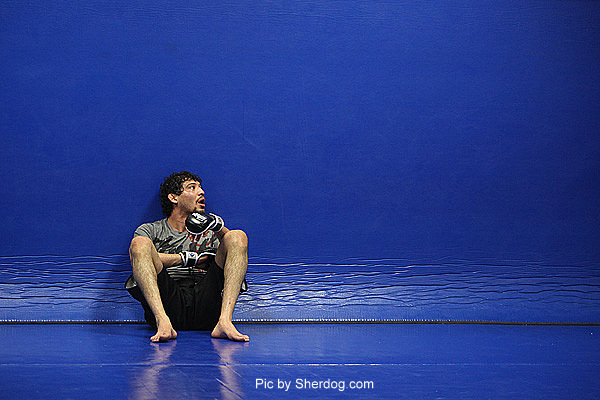 So who should Melendez fight when he enters the octagon? By the time “El Nino” is ready to make his UFC debut, it might be time to see one of the top prospects in the UFC’s lightweight division to play the role as spoiler again. Dos Anjos (7-4 UFC) is coming off a 3 fight winning streak after entering the UFC 0-2. After watching Dos Anjos dominate Mark Bocek at UFC 154 in front of the Canadian crowd, he proved to me that he is a tough competitor, especially when his back is against the wall. He has a decent stand up game with a great ground game and solid wrestling to give Melendez a run for his money and spoil the Current Strikeforce lightweight champions UFC debut. Ever since Bellator has made a rematch clause for title fights, the biggest free agent could be making his way over to the UFC later than we thought. The thing we do know is I have Alvarez ranked #7 in the lightweight rankings and that he will eventually make it over to the UFC. If Alvarez gets signed around the time Melendez makes his debut, what a better fight and debut for both fighters? Take a former champ in Alvarez who is riding a two fight winning streak and who is 9-1 in his last 10 fights versus a current champ in “El Nino” and you have one of the best UFC debut’s for both. Maynard was expected to face Joe Lauzon on December 29, 2012 at UFC 155 but Maynard had to pull out of the bout citing a knee injury and was replaced by Jim Miller. I know injuries aren’t a good thing, but this couldn’t have come at a better time. By the time Melendez will be making his UFC debut, Maynard could have recovered and be ready for a top level opponent. Maynard holds notable wins over Frankie Edgar, Kenny Florian and current number one contender Nate Diaz. A lot of fans thought that the Lauzon fight would of been lopsided, but what a better test for “The Bully” than a true champion? After next Saturday’s UFC on Fox 5 match-up between lightweight Champion Ben Henderson and current number one contender (and Melendez’s training partner) Nate Diaz, the division will need a new number one contender. Many believe that the new number one contender will come out of the January match-up between Donald “Cowboy” Cerrone and Anthony “Showtime” Pettis. This is very possible, but I guarantee you that Melendez won’t let that happen. I expect Melendez to have to fight one fight (if that) before getting a UFC lightweight title shot. If anything, Melendez might end up with the winner of Cerrone/Pettis but he could easily walk into the UFC and get the next shot at the title after next Saturday. This one is very far fetched, but could very well happen. The current UFC featherweight champion has made it very clear if he beats Frankie Edgar at UFC 156, that he wants to move up to lightweight and make a run at the title. What a better way to do so than taking out the current Strikeforce lightweight champion. Imagine if Aldo beats Edgar, takes some time off until summer, and Melendez makes his UFC debut in a main event against Aldo. Aldo and “El Nino” would be a dream fight and could happen, but I would love to see Aldo make his lightweight debut against someone worthy without getting an immediate title shot, and what a better opponent to test yourself against than Melendez? Watch highlights from El Nino’s career in the video below.